First of all, a hearty welcome to all the new readers who’ve posted in my comments here, and a fair number more who’ve left tracks in my webstats. I’ve had a number of links posted to my Sad Puppy Summary and Wrapup from some sites a great deal bigger than mine, including John C. Wright’s, Mike Glyer’s File 770, and Monster Hunter Nation, egad. Now you’re all probably wondering why I haven’t posted anything new since May 31. I don’t post as often as I did ten years ago, but two weeks away is unusual for me. It’s just bad timing, timing we did not control: We got a decent offer for our condo outside Chicago, and accepted it. That meant we had to drive 1,100 miles, empty it out, clean it up, sort the garageful of artifacts transported to Carol’s sister’s house, complete the paperwork (which was complex, as there were multiple owners including a trust) pack a Durango and a half’s worth of artifacts into a single Durango, and then drive 1,100 miles back home. The process included some brute-force moving of furniture, many trips to Goodwill, and considerable exercise of my tessellation superpower in order to pack way too much stuff into way too little space. Forgive me if I’m exhausted. I’ll be turning 63 in two weeks, and feeling every nanosecond of it. So give me a day or three to recover. There’s much to write about, most of it concerning writing, especially my plans for the coming year. I should be posting The Cunning Blood for sale on the Kindle store some time in July, for the princely price of $2.99. 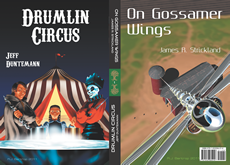 “Drumlin Boiler” will go up shortly after that, for 99c. “Whale Meat” is already there, for 99c. I still need a cover for my novella “Firejammer,” but the ebook is otherwise complete. Are you artist enough to draw a stone castle / warship sailing on an ocean of molten lava? I pay reasonably well for covers. The big deal happens on January 7, 2016, when I’ll be releasing Ten Gentle Opportunities on Kindle, with paperbacks from CreateSpace. I have a cover contracted for that, from the dazzling Blake Henriksen, but I’m thinking of buying some interior art as well from other artists. Interested? Contact me. It’s my first new novel in ten years, and I’ll be putting my back into the launch. In the meantime, I have to develop a Web presence for my fiction around the hardsf.com domain that I registered twenty years ago and never figured out what to do with. I’ll need some art for that as well, and I have a great deal of studying to do on WordPress extensions and internals. January 7 seems like a long way off. It’s not. So hang in there. More stuff coming. As preface, you might go back and reread my New Year’s Eve 2014 post, which will be relevant to coming entries. Ditto my series on Sarah Hoyt’s Human Wave idea, at least until you get to the Sad Puppies part, at which point you can stop. I’ve already said most of what I want to say about that, and need to get on to other things. It’s time to go take another Aleve, but man, (he said zenily) I haven’t felt this good in a long time. Welcome back and I don’t envy your Chicago trip one bit — it reminds me too much of some things I had rather not remember. I remember your 2014 New Years eve post very well and am excited to see where this leads. I have strong feelings that the best us on the way. Glad you’re back, Jeff. Hey, can you project that tessellation superpower at distance? I’ll happily pay for beaming a little this way. I can’t even walk through my garage anymore. Jeff, any thought of being able to sell to the Nook as well? I have a friend who has a Nook and is a voracious E-book reader, that I’d like to introduce to your stuff. Amazon just utterly reworked the payment algorithms for Kindle Unlimited, and I have to study them before I decide whether I participate. If I don’t, all books will be sold on Nook. Thanks to Esther Schindler for pointing me to it. I’m still kind of worn out from the trip. More in days to come. Hmm. I looked through that post and the situation looked…problematic. Is it possible to publish on Kindle without being part of the KU program? Yes, definitely. I’ve had some stuff up there for several years. The changes in KU remind me of the changes Google made to their Adsense Web ad program back in 2007 or so, which cut payments so badly that I just stopped using it. I may try it with a couple of items and see how much revenue I get for how many sales. 1) regarding “Erbo” comment about Nook version….just install the Kindle reading app on the Nook. Then go. 2) Regarding WordPress stuff: I can help. For reference, I did the redesign of John D Brown’s site (www.johndbrown.com) according to his needs/desires. Also in charge of Jerry Pournelle’s blog (www.jerrypournelle.com/chaosmanor ; he liked a minimal design, nothing flashy). You should concentrate on writing. Good job on Jerry’s Chaos Manor site! I love the simple nature of it. It’s sad that Jerry is having a hard time writing these days.. has to look at the keyboard and makes lots of tedious mistakes. He’s a brilliant guy, and tough as well. He also pens some of the best political commentary I have found. > just install the Kindle reading app on the Nook. Then go. The easiest thing would be if Jeff’s books were somehow available through the Nook store. We’re dealing with someone that’s highly technically challenged here (her, not me). I bought a nook HD+ when they came out with the express purpose of running Cyanogen Mod on it. I had done the download and build for my wife’s Nook Color a year or so prior to that with no trouble. However, I found that the prebuilt images are available for purchase (I got mine from N2Acards.com) or they will sell and ship you a card with it installed. That makes it completely plug and play. Just pop the card in and it boots the Cyanogen mod version of Android. Watch your email. I’m definitely interested. If the Kindle version is not encumbered with DRM, you can use Calibre to change to EPUB or several other popular formats. Jeff’s other e-books have not been DRM ‘protected’; so, you should be fine with the new ones. Unless forced by the online store, my ebooks will never be polluted by DRM. This is unlikely, as DRM is becoming less and less common, even from the big imprints. If piracy is a problem, DRM is not the solution, as I’ve said countless times here and elsewhere. I’m not sure he does book covers for other authors, but I actually went to college with him, so he might make an exception for me. It’s worth an ask, fersure.